In an era when Enzo Ferrari was still in charge, the 1960s were a time of great change at Maranello. 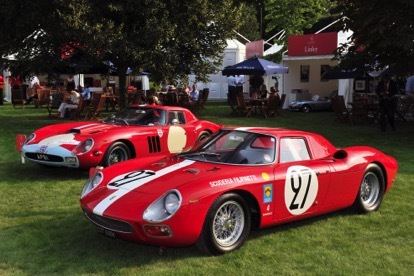 After the success of the 250 SWB Berlinettas and 250 GTOs in GT classes, a successor was needed to counter increasing opposition from the encroaching Cobras; hence the introduction of the Le Mans (LM) special in 1963. The specification of the 250 LM was groundbreaking for many reasons; it marked the first mid-engined ‘GT’, which apart from the prototype, donned a longitudinally mounted dry sump V12, producing 360bhp. Through a five speed non-synchromesh gearbox this charged the LM to a top speed of 186mph. Using a conventional multi-tubular frame type, the side chassis also doubled as water and oil carriers from the radiators to the engine. Running independent suspension with double wishbones and coil springs on all four wheels, the LM had front and rear anti-roll bars coupled with Dunlop disc brakes all round. The 250 LM has won both at the 12 Hour endurance race at Reims, driven by Joakim Bonnier and Graham Hill, but most famously the 24 Hours of Le Mans in 1965, with Jochen Rindt and Masten Gregory at the wheel.